In Middle Ages the lake was in common use by neighbouring Estonian and Votian village communities. Customary law allowed everybody from the neighbourhood to fish in the lake. Until the 14th century there was no permanent settlement on the lakeshore – only during the 15th century the first fishermen villages appeared. The lands surrounding the lake did not suit well for agriculture, so the lake and the activities connected with the lake provided living. 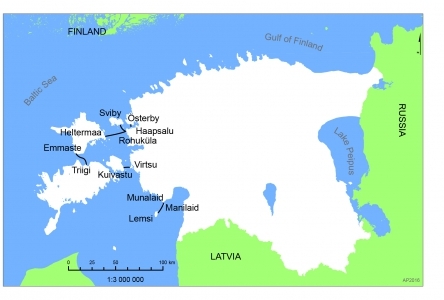 During the 18th–19th centuries the people of Estonian, Votian, Izhorian (all Finno-Ugric) and Russian origin amalgamated into two distinct groups defined by language and religion – Estonian speakers who were mostly Lutherans and Russian speakers who divided into two groups – Old Believers and Orthodox. Russian Old Believers (or Starovery or Raskolniks) follow the traditions of older Russian Orthodoxy and do not approve the church reforms carried out by Patriarch Nikon supported by Czar Alexey I in 1650s and 1660s. To avoid persecution they fled beyond the boundaries of what was then Russia. They reached the shores of Lake Peipus sometime in the end of 17th century. A more numerous community of Starovery settled the shores of Lake Peipus after the Great Nordic War (Estonia belonged now instead of Sweden to Russia) in 1730s and rented land and fishing gear. They cultivated the bad sandy soils that the Baltic German landlords and Estonian peasants showed no interest in. Ice cover on Lake Peipus forms at the end of November, in mild winters even later. Ice cover is the thickest (average 50–60 cm) by the second half of March. Due to currents and wind, cracks that can be several metres wide appear in the ice cover. These cracks may partly freeze over during severe frosts. Later, low ice hammocks form in such places. During the period of ice breaking, significant quantities of ice may be driven ashore by strong winds and may cause severe damage in the coastal zone.3 The season for 2015/2016 winter was poor for ice-roads. According to oral history interviews with the Russian Old Believers, their identity rests on three legs: faith, fishing for men and growing onions for women; making a healthy diet (see more on The Onion Route4). Interviews revealed an interesting fact of how humans related to the lake (or society and environment, if you will) in the beginning of the 20th century. Namely, as the Starovery agricultural aspirations were limited, they did not need a horse in the summer for fieldwork, which was done in the garden with hand and spade, nor did they have enough land to feed the horse but a horse was required during winter time to make 15 km trips to the lake for several days of fishing and sometimes to sledge hay from distant (marsh) meadows that was not procured with boats. Thus, horse was seasonal, bought in autumn and sold in spring. Kurs, O. 200: Peipsimaa majandusliku ja kultuurilise siirdevööndina. In: Kurs, O. Rajamaade rahvaid. Eesti mõttelugu 68. Tartu: Ilmamaa, pp. 95–109. See more on that in Palang, H., A. Printsmann and H. Sooväli 2007: Seasonality and landscapes. In: Palang, H., H. Sooväli and A. Printsmann (eds.) Seasonal Landscapes (in: Décamps, H., B. Tress and G. Tress (eds.) Landscape Series 7). Dordrecht: Springer, pp. 1−16.